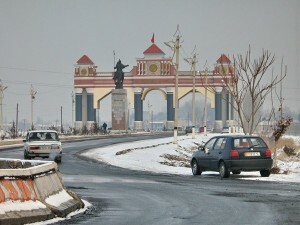 Jalalabad is the administrative, economic and cultural centre of Jalalabad oblast (province). 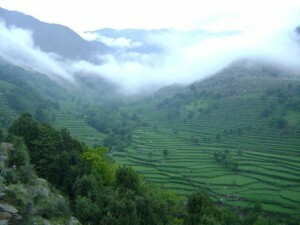 It lies in the south of the Kugart valley, in the foothills of the Babash Ata mountains to the North. The climate is noted for dry, hot summers, warm and sunny autumns with rare rain bursts and winters are warm with high humidity. The region is a centre for fruit and vegetable growing. 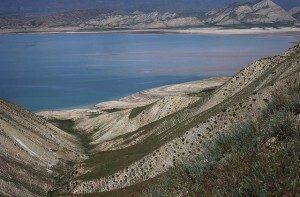 One of Kyrgyzstan’s main branches of the Silk Road passed through Jalalabad and the region has played host to travelers for thousands of years, although little archaeological remains are visible today – except in some of the more remote parts of the oblast – such as Saimalu Tash and the Chatkal valley. These have included travelers, traders, tourists and pilgrims (to the various holy sights) and sick people visiting the curative spas such as in the Ayub Tau mountain, at the altitude of 700 m above sea level some three kilometers out of town. Jalalabad is famous for its spas. There is a legend that the water from the Hozret-Ayub-Paigambar spa cured lepers. According to the legend there was a grave, a mosque and the khan’s palace near the spa. The Jalalabad sanatoria, “Kurort”, is based on one of the spas on one of the hils overlooking the town – the waters are salty, but people from a wide area to collect bottles of it. Near the entrance to the Kurort (the health resort) is a cafe with a fine view over the town – the “Ikram-Ajy” Panorama, at a height of 1000 meters , with a complex that consists of a “national crafts hall”, souvenir shop and an entertainment hall –from here you can appreciate how green the city is, as the trees rise above the low-rise building. The spas are also the source for several different brands of mineral water. Abad is often used in Asian place names to refer to the person who founded the community. It is said that Jalalabad was named after Djalal-ad-Din, who was renowned for setting up caravanserais to serve travelers – and especially the many pilgrims who came to the holy mountain. In early 19 the century a small Kokand fortress was built, and a small village (kishlak) grew up around this. The local people were engaged in agriculture, trade and provided services to the pilgrims visiting the spas. Then, in the 1870’s, Russian migrants came to the region. They set up a garrison town and military hospital. 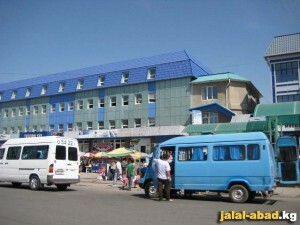 Jalalabad developed as a market town. Where cattle were bought and sold, and so became known as a place of interaction between agricultural and nomadic peoples. The town had medieval narrow curved streets and the houses were surrounded with high clay walls. Only mosques were decorated with colorful ornaments. In 1916 a railway was built from Andijan to Jalal-Abad. When the Soviets established their power in the region, great importance was attached to the Jalalabad spas. Health resorts were built and both agriculture and the food industry developed rapidly. 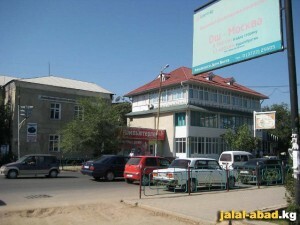 The city underwent a major period of reconstruction in the 1950’s. Nowadays Jalalabad is home to enterprises in the oil, construction, wood processing, electro-technical, light and food industries. There is a thriving market – and a local shop, which specializes in things like “walnut jam” – made from immature fruits (before the husks have formed) and honey. 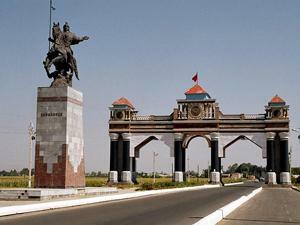 As in all former Soviet towns the main street was called Lenin Street – and in Jalalabad it has retained it’s name, fountains and statue of Vladimir Illych. There is a historical and cultural museum. Near the bazaar is a shop, which sells a local delicacy – walnut jam. The “fruits” are taken from the tree before the hard husk has formed and boiled. The fruit is whole and suspended in a sweet syrup, rather than a thich jam. They also sell things like walnuts in honey. In the bazaar it is possible to buy all sorts of fresh fruits and a wide variety of nuts. 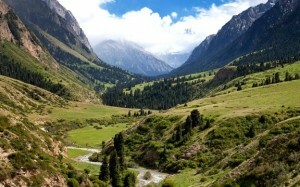 One of Kyrgyzstan’s main branches of the Silk Road passed through Jalalabat and the region has played host to travelers for thousands of years, although little archaeological remains are visible today – except in some of the more remote parts of the region – such as Saimalu Tash and the Chatkal valley. These have included travelers, traders, tourists and pilgrims (to the various holy sights) and sick people visiting the curative spas such as in the Ayub Tau mountain, at the altitude of 700 m above sea level some three kilometers out of town. There is a legend that the water from the Azreti-Ayup-Paygambar spa cured lepers. According to the legend there was a grave, a mosque and the khan’s palace near the spa. Abad is often used in Asian cities names to refer to the person who founded the community. It is said that Jalalabat was named after Jalal ad Din, who was renowned for setting up Caravanserais to serve travelers and many pilgrims who came to the holy mountain. In early 19th century a small Kokand fortress was built, and a small Kishlak grew up around this. The local people were engaged in agriculture, trade and provided services to the pilgrims visiting the spas. Then, in the 1870s, Russian migrants came to the region. They set up a garrison town and military hospital. 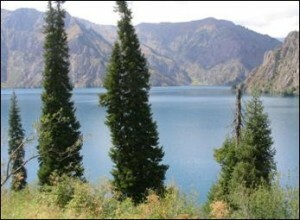 The train line runs from the Ferghana valley northeast about 30 km to Kokjangak. Biggest Companies: Kyrgyz-Canada JV “Kyrgyz Petroleum Company”, АО «Kelechek», АО «Nur». AOZT «KyrgyzChlopok», JV «Ak-Altyn» process cotton. 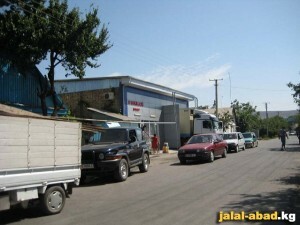 There are the tobacco-curing companies «Tura-Ai» Ltd and «Aziz-Tabak» Ltd., that export 90% of their output to 17 countries. 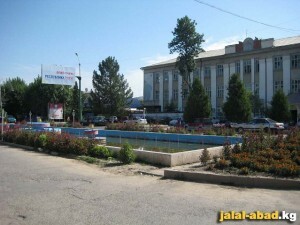 There are also mill houses АО «Azrat Ayib», AOZT PTK «Intershaq», «Mariam & Co» ltd, and the liquor manufacturer AOZT «Jalalabat Arak Zavodu».